Life on Earth is One Big Extended Family, and therefore we are related in an exact way, not only to every other living thing, but also to every thing that has ever lived. This view of life can be thought of as evolutionary genealogy, I suppose. In the family, life is brought not only to our doorstep, but also into our kitchens, bedrooms, and dens. In the family, life is happening all around us, and it begs to be questioned, evaluated, interpreted, and discussed. There is no more consistent, pregnant, dynamic forum for instruction about life than the family, because that is exactly what God designed the family to be, a learning community. Every living thing on our planet has a family tree. This “family tree” shows the relationship of one living thing to other living things. Scientists call the study of how living things are related, taxonomy. All life begins. Living things all have a moment at which they become “alive.” That beginning of life marks the first point on the circle of life. Each family of living things has its own life cycle. Some organisms, like some fast plants, are born, mature, and die rapidly. Other organisms, like bristlecone pine trees, have life cycles lasting for thousands of years. The human family has its origin in that same love with which the Creator embraces the created world, as was already expressed “in the beginning”, in the Book of Genesis (1:1). The divine mystery of the Incarnation of the Word thus has an intimate connection with the human family. The book of Genesis spells it out very clearly as Moses reveals how the first family came about. “Therefore a man shall leave his father and his mother and hold fast to his wife, and they shall become one flesh,” (2:24). Marriage came first. Then, in chapter 4:1: “Adam knew Eve his wife,” (sexual intimacy) “and she conceived,” (conception) “and bore Cain…” (Birth). There you have it—the four-fold process created by God for becoming a biological family. Have you ever been to a family reunion? Do you get together with your relatives on your birthday? If you do you might talk with your uncle, aunt, or second cousin. You may even have seen your family tree. This shows your different relatives and illustrates how everyone is related. Families are whom you love. Our families all “look” different and it’s always been so. 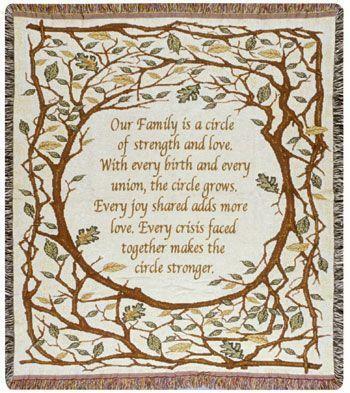 A family care giving unit might consist of a couple; a mother, father and children; a single parent and child; grandparent and grandchildren; a sibling group; a circle of friends or however that family defines itself. We have had many families over time. Our family of origin, the family we created, and the groups you moved through while all of this was happening: friends, lovers, sometimes even strangers. None of them perfect, and we couldn’t expect them to be. You can’t make any one person your world. The trick was to take what each could give you and build your world from it. So, what is family? They were the people who claimed you. In good, in bad, in parts or in whole, they were the ones who showed up, who stayed in there, regardless. It wasn’t just about blood relations or shared chromosomes, but something wider, bigger. In human context, a family (from Latin: familia) is a group of people affiliated by consanguinity, affinity, or co-residence. In most societies it is the principal institution for the socialization of children. Anthropologists most generally classify family organization as matrilocal (a mother and her children); conjugal (a husband, his wife, and children; also called nuclear family); and consanguineal (also called an extended family) in which parents and children co-reside with other members of one parent’s family. There are also concepts of family that break with tradition within particular societies, or those that are transplanted via migration to flourish or else cease within their new societies. Families are the foundation of society. It’s where we come into the world, are nurtured and given the tools to go out into the world, capable and healthy—or we aren’t. While families have the greatest potential for raising healthy individuals, they can also wound their members in places that will never heal. When families break down and fail to provide the healthy nurturing we need, the effects impact not only our own lives, but also our communities. * The costs of a social support system to deal with the fallout from dysfunctional family relationships. The history of the family is a branch of Social history that concerns the sociocultural evolution of kinship groups from prehistoric to modern times. The family has a universal and basic role in all societies. Research on the history of the family crosses disciplines and cultures, aiming to understand the structure and function of a family from many viewpoints. For example, sociological, ecological or economical perspectives are used to view the interrelationships between individuals, their relatives and the historical time. The study of family history has shown that family systems are flexible, culturally diverse and adaptive to ecological and economical conditions. Certain kinds of politicians and religious leaders often tell us that society’s problems result from the break up of the family, but what is this ideal family formula that we should stick to? The modern ideal still seems to be the nuclear family consisting of a mother, a father, two children and a dog but is there any rationale behind this grouping or are we just drawing arbitrary lines and declaring that one size fits all? Some commentators might say that the nature of the family has changed in modern times but is the diversity of family models apparent today anything new? The most profound meaning of the term “civilization” is not merely political, but rather pertains to human culture. Civilization belongs to human history because it answers man’s spiritual and moral needs. Created in the image and likeness of God, man has received the world from the hands of the Creator, together with the task of shaping it in his own image and likeness. The fulfillment of this task gives rise to civilization, which in the final analysis is nothing else than the “humanization of the world”. Experience teaches that human love, which naturally tends towards fatherhood and motherhood, is sometimes affected by a profound crisis and is thus seriously threatened. In such cases, help can be sought at marriage and family counseling centers, where it is possible, among other things, to obtain the assistance of specifically trained psychologists and psychotherapists. Fatherhood and motherhood are themselves a particular proof of love; they make it possible to discover love’s extension and original depth. God created everything and we are connected to each other because of HIS divine plans. When you consider the family you are able to see the glory of God because his wisdom is manifested in fitly joining us together without our consent. Even though we are individuals we share a part of who we are through our intermediate and extended families. It is a path common to all, yet one, which is particular, unique and unrepeatable, just as every individual is unrepeatable; it is a path from which man cannot withdraw. Indeed, a person normally comes into the world within a family, and can be said to owe to the family the very fact of his existing as an individual. When he has no family, the person coming into the world develops an anguished sense of pain and loss, one, which will subsequently burden his whole life. Even if someone chooses to remain single, the family continues to be, as it were, his existential horizon, that fundamental community in which the whole network of social relations is grounded, from the closest and most immediate to the most distant. Do we not often speak of the “human family” when referring to all the people living in the world? The family was God’s first earthly institution. Before there was a government, and long before God instituted the “church”, He ordained marriage and the family as the basic building block of society. The destruction of the family we are witnessing today is a harbinger of the ultimate collapse of our entire society. The more the family is threatened, the more society itself is in danger of extinction. The family system brings the rights of the husband, wife, children, and relatives into a fine equilibrium. It nourishes unselfish behavior, generosity, and love in the framework of a well-organized family system. The peace and security offered by a stable family unit is greatly valued, and it is seen as essential for the spiritual growth of its members. A harmonious social order is created by the existence of extended families and by treasuring children. Ultimately, the family determines the climate and forecast of society. According to most, the family, which is the basic unit of civilization, is now disintegrating. But, a professor emeritus at the University of California at Davis, reminds us that human cooperation is rooted not in war making, as sociobiologists have believed, but in baby making and baby-sitting. Studies show that having a successful family life ranks at the top of the list for most Americans. A vital element for building a family is instilling a healthy sense of heritage – an appreciation of family roots, both earthly and spiritual. Yet it is increasingly common in our world for children to have no such sense of continuity or regard for family history. Too many feel that they have come from nothing and are bound for nothing. Today, there is a cry in the earth to unite and reunite with our earthly biological families. God created families and no one is able to choose their father and mother. WE must set aside our differences and forgive each other and any offences that we experienced from one and other. There is zero tolerance for division in families because God says to love your enemies and to owe no man anything but to love them. Let the past go because you can do nothing to change it. You must forgive and love all the time. This entry was posted in Uncategorized and tagged African American, Ancestors, ancient egypt, Book of Genesis, child, children, Circle of Life, consciousness, education, Family, Family Resources and Support, god, health, Home, human, humanity, islam, life, love, National Governors Association, Parent, Slave, Spencer Wells, Ted Talks, The Human Family Tree, The True Way Of LIfe. Bookmark the permalink.